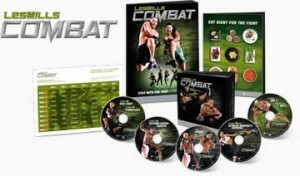 Les Mills Combat Is Now Available! Les Mills Combat is here! The Les Mills Combat workout program is the newest addition to Beachbody’s catalog, and it looks awesome. This is a 60 day workout that is based on 6 different forms of martial arts, Karate & Kung Fu, Jiu Jitsu, Muay Thai Kickboxing, Capoeira, Tae Kwon Do, and Boxing. Les Mills Combat is the ultimate in-home mixed martial arts workout that is guaranteed to transform you your body in 60 days, or your money back! Punch, kick, block, and strike your way to a new body today with Les Mills Combat! Order Les Mills Combat Directly From Team Beachbody!